For creative and textured lettering, you might try using a free chain link font. But designers beware: when the client says "chain link," there are few different things they could mean. The good news is that there is a plethora of chain link fonts on the web. Many of them are free as well, and come in full font sets complete with symbols. Fontographers such as the talented Robert Schenk have taken the time to create fonts based on a "chain link theme." His particular version, Chain Letter, was designed in 1995 and is currently distributed by Ingrimayne for about $15. Like most professionally distributed fonts, it comes in a variety of Windows and Mac-compatible TrueType and PostScript versions - part of the reason it is often worth it to pay for fonts. Chain Letter is similar to Schenk's version, in that each letter is made up of lengths of chain with the links clearly shown. This may be useful for titles or initial letters, but be aware that this kind of lettering is not suitable for blocks of prose. KR Ball and Chain is more stylized, showing several letters in bold serif-based caps each with an entangling ball-and-chain included. Chain Link is a free font available from FontSpace that shows letters inside of individual lengths of chain, which is a variation of the theme. There are also many stylized chain fonts that are available for purchase (linked off of the AbstractFonts site) but free is usually the choice of freelancers everywhere. Be aware that you get what you pay for; the free chain link font listed above, for example, only has one case and a limited number of special characters. Also, not all fonts listed as "free" on a site are actually free - some are simply stolen, so it's a good idea to read the fine print on sites such as Larabie Fonts to make sure that your intended use is legal. However, in the case of chain link fonts, there's an even larger danger than stolen fonts or even downloadable viruses: what if your client asks for a chain link font and you pick the wrong one? 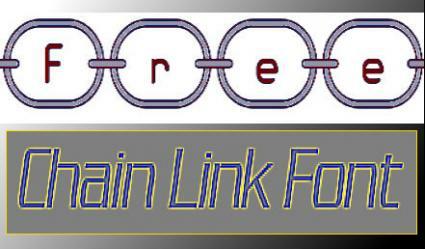 While it makes sense that a chain link font would have letters made of chains, the fact is there is another font that goes by the name "Chainlink" that has nothing to do with links at all. As shown at the popular font download site Golden Web Free Fonts, the Chainlink font added there in 2007 is a sans-serif squared-off font with a few symbols included with upper and lower cases. It resembles lettering used in many science-fiction themed pieces, including the hit TV series Babylon 5. It would be a good idea to check with any client that asks for "chain link style font" to be sure they mean links and not sci-fi. If it is the latter, though, Golden Web has a free download in True-Type Format, and there is also a version at Fonts101 that is oblique and may meet your needs better. Whichever version you use, the chain link font is definitely a more abstract font, not suitable for long segments of text. It can be very effective when applied to signs, covers, and labels, however - giving a bit of graphic design to your product. Just keep in mind that the links add a level of busy-ness to the lettering that can make the human eye shy away from the message contained within - so keep the words simple, short, and concise, to increase the impact of your chain letters.